DURHAM, NC—Though cautioning that it is still early in the season, a beaming Mike Krzyzewski told reporters Monday he has not seen a Duke team this unlikable in many years, and is optimistic about the Blue Devils' chances to grow even more repulsive and annoying with practice. "Obviously, we set the pace early with my all-time wins record and the never-ending, fawning media hoopla over that, and I think we've been able to stay consistently repellent since then," said Coach Krzyzewski, who argued that his current players' obnoxious ability to draw charges compares with his most loathsome teams ever, giving them the potential to become more infuriating than any J.J. Redick­–led squad. 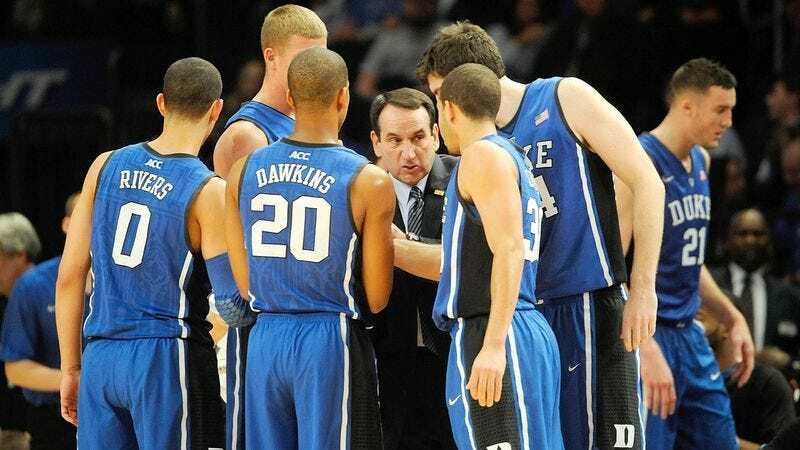 "We've got Stephen Curry's little brother, a ball-hogging NBA coach's son, three Plumlees, and a whole roster of overprivileged assholes, so all the pieces are in place for this to be one of the prickiest teams in Blue Devils history. We just need to get it done." Krzyzewski said he does not want to weigh the team down with expectations, but college basketball fans should not be surprised to find themselves cursing and turning off their televisions in utter disgust come March.